I picked up a copy for $30 from Amazon. - Played on the PS3 using the six axis controller. - I also own the pc cd-rom, pc dvd-rom, dvd video versions of this game. - Best video quality yet. They did a pretty good job restoring it. - Gameplay is pretty smooth. The pauses between scene jumps/branches is pretty smooth. Occasionally I got some pop from the speakers when this happened (only happened maybe twice during the whole game). - Lots of options and extras. You can set to infinite lives. There are a lot of nice HD extras like an entire pip commentary, interviews, watch mode, etc. 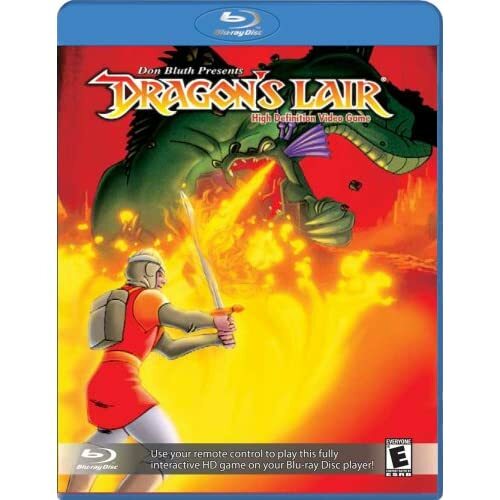 There is this really nice comparison video (the last sequence) where they show you split screen all the different versions of dragon's lair compared to the blu-ray version. It really is quite staggering. - 5.1 mix is fine. It doesn't really add a whole lot though. - Don Bluth is looking pretty old there. - Image is CROPPED!!!! To get it to fit a 16:9 aspect ratio the original 4:3 material has the top and bottom CUT OFF!!!! THERE IS NO OPTION TO CHOOSE 4:3 PILLAR BOX!!!! With all the space on blu-ray they really should have had both versions on there and let you choose. This really is inexcusable! Granted, most people might not care. It plays fine in 16:9. But for the purest and the collectors out there this is pretty inexcusable. Who else is going to spend $30 on a blu-ray version of a 24 year old game you can complete in like 30 minutes. Overall I recommend it to the collector who can overlook the one grievous mistake. It is still by far the best looking and most playable Dragon's Lair yet. The extra content is a nice bonus too. Now, bring me Space Ace and Dragon's Lair II but do it RIGHT!